We received product from Chewy.com for free. Pawsitively Pets only shares information we feel is relevant to our readers. While fleas and ticks can be a year round nuisance, they do seem to enjoy the Spring where I live. We don't have a huge tick problem here, but I do find one occasionally. Maybe one or two a year. However, we do have a large flea population much to my dismay. It can get pretty bad and I absolutely have to stay on top of flea control. I've used several methods of flea control in the past and while trying to decide what I wanted to use this time around for my dog, Shiner, Chewy.com asked if we'd like to try Seresto®. 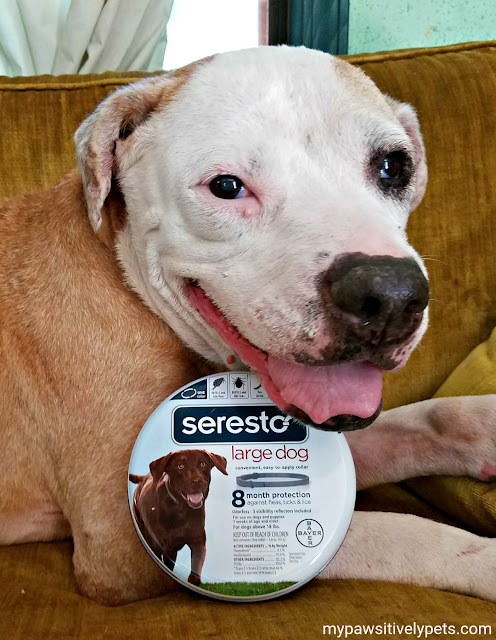 I've used Seresto in the past and it's always worked well, so I am happy to use it again this year for flea and tick protection.